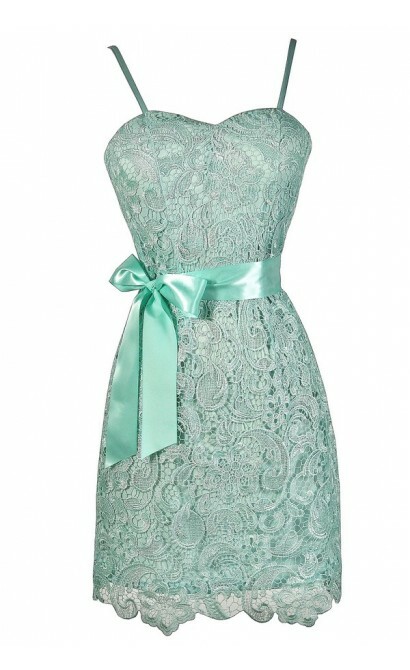 You have added Perfect Present Crochet Lace Dress With Ribbon Sash in Mint into shopping cart. You'll be prettier than a present when you show up to your next party in this crochet lace dress with a fabric sash around the waist. The Perfect Present Crochet Lace Dress With Ribbon Sash is fully lined and made of floral crochet lace. It has a sweetheart neckline and lightly padded bust. Adjustable spaghetti straps allow you to control the fit of this dress. We loved the uneven lace hemline at the bottom as well as the classic cut. A fabric sash wraps around the waist and can be tied into a pretty bow. A hidden back zipper completes this look. The Perfect Present Crochet Lace Dress would look nice paired with pumps or strappy heels and a clutch. This is a cute party dress for any occasion. Details: Fully lined. Adjustable spaghetti straps. Lightly padded bust. Hidden back zipper. 100% polyester. Hand wash cold with like colors. Do not bleach. Low iron. Small measurements: Length from top of bust to hemline: 29". Bust: 30". 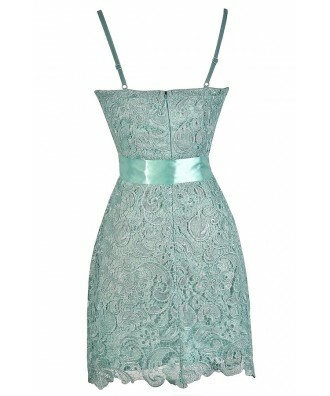 You have added Perfect Present Crochet Lace Dress With Ribbon Sash in Mint into Wishlist. You have added Perfect Present Crochet Lace Dress With Ribbon Sash in Mint for Stock Notification. You have set Perfect Present Crochet Lace Dress With Ribbon Sash in Mint as a loved product. You have removed Perfect Present Crochet Lace Dress With Ribbon Sash in Mint as a loved product.